You’ll love Smile L.A. Modern Dentistry’s convenient location. Exceptional dental care is a lot closer than you think. 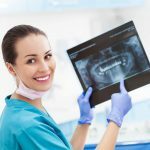 Dr. K. Yousefzadeh’s general dentistry and cosmetic dentistry practice in Los Angeles, CA is easily accessible to patients throughout the area. Our great location, convenient office hours and friendly staff make every visit to Smile L.A. Modern Dentistry a pleasant experience. Remember, you don’t have to travel far get the quality care you deserve. Please see parking and public transit details below. This parking structure requires some stairs and taking an elevator to the second floor. (Parking attendee will collect $12-16 (cash or credit cards accepted) when you enter and will give you a ticket, please bring the ticket with you so we can validate it for $8-12. The parking attendant will refund you all but $4 upon leaving when you turn in the validated parking ticket. Enter This parking structure from Olive St. entrance, located on the left-hand side just north of 6th street. If using 6th Street, make a left on Olive. Olive is one-way North. The entrance is small, and it is located on the left side just as you enter Olive. please Pay close attention as the entrance is small. The parking attendants will take your keys and park the car for you. After you park attendants will guide you. you may need to go up a few steps and take the elevator from level B to 2nd floor. make a left as you exit the elevator and go to suite 202. We are waiting to satisfy your dental needs. We do not recommend using the Grand Ave entrance valet parking since we can not offer validation for it. If you chose to enter through this parking structure, you are responsible for the whole amount of parking ticket. In case you use the valet parking, enter main lobby valet parking from Grand Avenue. Grand Ave is one way heading south. Pacific Center Entrance is on the left (just passed the pedestrian crosswalk marking) on Grand before 6th St. “Pac Mutual Parking” sign marks the parking entrance. Grand Ave. is one-way south so if you are taking the 6th street, you will have to go around the block (L on Olive, L on 5th St., left on Grand Ave) to reach the Grand Ave. parking entrance. This parking will lead you to the beautiful main lobby of the building with no stairs to climb. From there you can take the elevator to the second floor. make a right as you exit the elevator. We are waiting for you. We are close to Pershing square which serves the following. There are many bus stops around the office accessible from anywhere in Los Angeles. • Red and Purple Line service hours are approximately from 5:00 AM until 12:45 AM daily. •  Silver Line service hours are approximately from 4:15 AM until 1:45 AM Monday- Friday & 5:00 A.M.- 1:45 A.M. Saturdays/ Sundays & Holidays.